In what is claimed to be one of the largest investments in Latvia’s history, whilst also proving a welcome boost to Bombardier’s stalled sales programme, Riga-based airline airBaltic has signed up to a firm purchase of 30 Bombardier CS300 aircraft, with options for an additional 30 of the type. Based on current list prices, the firm order is valued at approximately US$2.9 billion. This amount will increase to some US$5.9 billion should all additional 30 purchase rights be exercised. Deliveries are scheduled to commence in the fourth quarter of 2019. The company’s own financial resources will be used to acquire the aircraft, Martin Gauss, chief executive of airBaltic, has explained to ATO.ru, Russian Aviation Insider’s sister publication. This latest order complements the existing order for 20 CS300s and forms the backbone of the new airBaltic’s future expansion project called Destination 2025. This new business plan relies on the expansion of routes from all three Baltic states – Latvia, Estonia and Lithuania – essentially covering the main European cities. At the same time, the carrier hopes to grab a slice of a rapidly growing demand in the European aircraft, crew, maintenance and insurance (ACMI) market, competing with fellow Baltic carriers SmartLynx, Small Planet Airlines and Avion Express. The strategy foresees that airBaltic will achieve a significant increase in passenger numbers and in revenues by 2025. Believing that “the most successful airlines in Europe operate uniform fleets of larger scale”, the Latvian hybrid airline plans to switch to an all-CS300 fleet by 2022. Currently, the airline is operating revenue services with eight CS300 aircraft, and is expected to take delivery of 12 more by 2019. It also operates 11 Boeing 737s and 12 Bombardier Q400NG turboprops, all of which will be gradually phased-out over the next three years. “As an early adopter of the C Series, we took a forward-looking decision on advanced technology to support our turnaround plan leading to sustainable profitability, and today we are benefiting from the most fuel-efficient, small single-aisle aircraft. With demonstrated fuel savings of more than 22 per cent, the aircraft type plays a vital role in maintaining our operating costs at a low level. In 2017, we experienced outstanding growth by successfully executing our fleet modernisation strategy, and are excited to further grow our fleet up to 80 CS300 aircraft while phasing out our other aircraft types in the next three years,” said chief executive Gauss. “2017 was the most successful year in the history of airBaltic, during which the company achieved exceptional operational and financial results. This serves as solid proof of the success of the strategy and the operating model of the airline. The new order is the largest investment in Latvia’s history and plays an important role in the development of the air infrastructure of the Baltic region,” emphasised Uldis Augulis, the Republic of Latvia’s minister of Transport. airBaltic serves more than 70 routes from all of the Baltic states’ capitals of Riga, Tallinn and Vilnius, offering what it calls “the largest variety of destinations and connections” via Riga to a network spanning Europe, Scandinavia, the CIS and the Middle East. 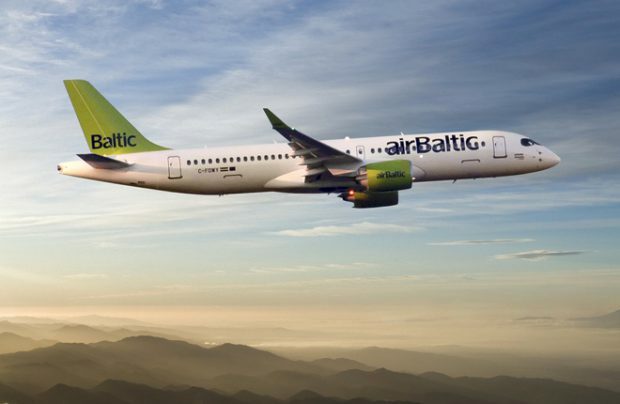 For the current summer season, airBaltic has introduced eight new destinations from Riga – to Malaga, Lisbon, Split, Bordeaux, Gdansk and Almaty, as well as to Sochi and Kaliningrad. In addition, it has launched a new direct route connecting Tallinn with London. A joint stock company established in 1995, airBaltic’s primary shareholder is the Latvian state, which holds 80.05 per cent of the shares, while Danish businessman Lars Thuesen holds around 20 per cent through his fully-owned Aircraft Leasing 1 SIA. In 2018 the carrier plans to transport four million passengers, with that number expected to grow to 10 million by 2025.